SEATTLE--(BUSINESS WIRE)--Sep. 14, 2016-- (NASDAQ: AMZN)—Amazon today introduced an all-new version of the groundbreaking Echo Dot for under $50, so you can add Alexa to any room in your home. Just like Echo, Echo Dot gives you access to all of Alexa’s capabilities—she can answer questions, play music, turn on the lights, set timers, give sports updates, check the weather, access over 3,000 Alexa skills, and much more. The all-new Echo Dot is available for pre-order at www.amazon.com/echodot and will begin shipping next month. Echo Dot has a new sleek and compact design, comes in either black or white, and is designed to disappear into any room in a house. With its built-in speaker, you can place Dot in the bedroom and use it as a smart alarm clock that can also turn off your lights. Or use Dot in the kitchen to easily set timers, ask for measurement conversions and recipes, and shop for tens of millions of Amazon products using just your voice. 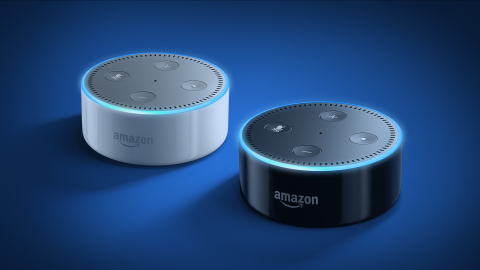 With the same array of seven microphones found in Amazon Echo, Dot uses beam-forming technology and enhanced noise cancellation to detect the wake word, Alexa, from across the room. The new Echo Dot features a more powerful speech processor, which delivers improved far-field speech recognition accuracy. Echo Dot can directly connect to speakers through Bluetooth or using a 3.5mm stereo cable, enabling you to add Alexa to your home entertainment system. Then, use just your voice to control Amazon Music, Prime Music, Pandora, Spotify, iHeartRadio, TuneIn, and more. Customers interested in purchasing a new Bluetooth speaker can take advantage of a special price when they purchase a bundle of select Bose speakers with an Echo Dot. Use Echo Dot to turn on the lamp before getting out of bed, change the temperature without leaving your chair, or dim the lights from the couch to watch a movie—all with just your voice. Echo Dot works with smart home devices such as lights, switches, fans, thermostats, garages, sprinklers, and more from leading smart home providers including Philips Hue, ecobee, TP-Link, Insteon, WeMo, Lutron, TrackR, Luma, Nest, Wink, Honeywell, Samsung SmartThings and Garageio. Customers interested in creating a smart home can save up to $50 on bundles with Echo Dot and smart home devices from ecobee, Philips, and TP-Link. For customers who have multiple Echo devices within hearing distance, Amazon’s new ESP technology intelligently calculates the clarity of the customer’s voice and determines which Echo is best to respond to the request—instantly. This feature is smart—performance gets better over time, so ESP will continuously improve as you use Echo. In multi-Echo households, ESP resolves the problem of two Echo devices answering you at the same time. This new feature will be available as a free update for all Echo devices—including Amazon Echo and the first generation Echo Dot—starting in the coming weeks. Alexa—the brain behind Echo Dot—is built in the cloud, so she is always getting smarter. Alexa can play music, and provide information, sports scores, weather, and more—instantly. The more you use Dot, the more it adapts to your speech patterns, vocabulary, and personal preferences. Thousands of third party developers are also building skills for Alexa—there are already over 3,000 skills available that let you do even more with Alexa. You can order a pizza through Dominos, request a ride from Uber, read Audiobooks with Audible, find flight information with Kayak, get cocktail recipe suggestions from Patrón, and much more. The all-new Echo Dot is available in either black or white and will start shipping next month. You can pre-order starting today at www.amazon.com/echodot. A single Echo Dot is available for $49.99. Otherwise, you can choose a six-pack for buy five, get one free, or a 12-pack for buy 10, get two free and easily Alexa-enable every room of your house.